Be a WRW Fundraiser and Get This Awesome Shirt! You know you want this shirt. It’s yours when you raise $50 or more on a free custom WRW2017 fundraising page. That’s right: we’ve got a special shirt for special people participating in WRW2017. Raise $50 or more on your custom fundraising page and you get this adorable, exclusive, locally designed t-shirt. I want it! How do I get that fundraising page? It’s easy! When you register for Walk Run Wag 2017 online, you’ll get the option to create a fundraising page. It’s fast and free and you can customize it with your own photos and your personal story about why you support us (thanks for doing so, by the way!). If you registered by mail, or signed up online way back in January, you can still create the customized fundraising page for free here. It takes just a few minutes — maybe even just seconds if you type fast! Remember: this shirt is available only to individuals who raise at least $50 through their official WRW2017 fundraising page. So sign up today and get that page going! WRW2017 Registration is OPEN! Early Bird Pricing NOW! So much news! Early Bird Pricing Ends May 31! Register today! Remember, children 10 and under register for free for the run or walk; however, you must register your child for them to participate in the event. Adults registered in advance for the run or walk will receive a race t-shirt during packet pick-up (we will post packet pick-up options soon). Children do not receive a shirt with free registration; however, children’s sizes of our WRW2017 shirt are available for purchase during the online registration process. Additional adult shirts and other merchandise are also available for purchase during online registration. Adults: a shirt in preferred size and cut is not guaranteed with day-of registration; if you really want a shirt (and who doesn’t?!) you should register in advance. Want to register old-school via snail mail instead of online? No problem. We will be posting a mail-in registration form with waiver for you to download, complete, sign and mail with registration fee. It is very important that you sign the waiver before mailing in your registration. We cannot accept your registration unless the waiver is signed. 10 a.m. marks the start of post-race fun including lure coursing, agility and much more! Got questions? We’ve got answers! Visit our FAQ or come say hi to us at the Great Lakes Pet Expo Saturday February 4 at the Wisconsin Expo Center at State Fair Park. Friends of MADACC will have a booth there in Hall A (North) near Cat Alley and the Educational Stage. Got enthusiasm? We love it! Why not join the Walk Run Wag organizing committee? No experience necessary, just a positive attitude and desire to make WRW2017 our best event yet! We invite you to attend our next meeting: 6 p.m. Wednesday, February 8 at MADACC, 3839 W. Burnham St., West Milwaukee. If you have questions about volunteering, please feel free to email us anytime at friends@madacc.org with “WRW Volunteer” in the subject line. This is it…Walk Run Wag 2014 is just hours away. Early Packet Pick-up for everyone who has already registered is today, 4-7:30 p.m. at MADACC, 3839 W. Burnham. Due to a large convention at Miller Park, we strongly recommend you avoid taking I-94 around rush hour this evening to reach us. Side streets will be a better bet! If you have registered but can’t stop by MADACC this afternoon or evening, you can pick up your packet tomorrow at Hart Park before the event. Packet pick-up will be available beginning at 8 a.m. We recommend you get there early to avoid lines. Due to the convention, heavy traffic is expected around Miller Park 7-10 a.m. tomorrow as well. Please factor this into your travel plans so you don’t miss a minute of Walk Run Wag fun! Haven’t registered yet? Don’t worry: you can also register tomorrow, beginning at 8 a.m., at Hart Park. We will have a limited number of t-shirts on-hand for people registering tomorrow. Once they’re gone, we’ll take your contact information and make sure you get your t-shirt in the mail after the event. If you have already registered, your t-shirt will be included in your race packet. The latest weather report says mid-70s and partly cloudy for race time, with the rain waiting until late in the afternoon. Sounds like perfect weather to Walk, Run and Wag…See you there! Thanks again to all our sponsors, supporters and volunteers…and especially to you! Now let’s get out there and have some fun! Yeah, we thought so. Register online today and start a fundraising page to collect additional donations to benefit the animals. 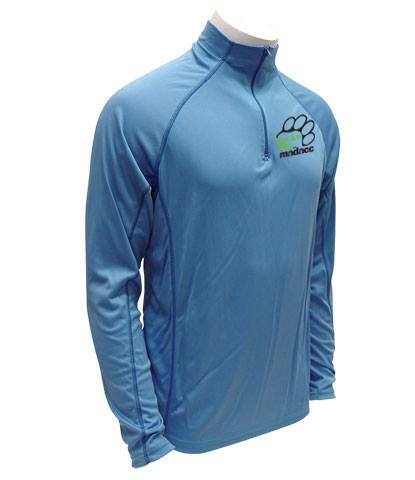 Raise $150 or more through your fundraising page and get this cool limited edition quarter-zip performance pullover with the Walk Run Wag logo (shirts will be delivered after the event). 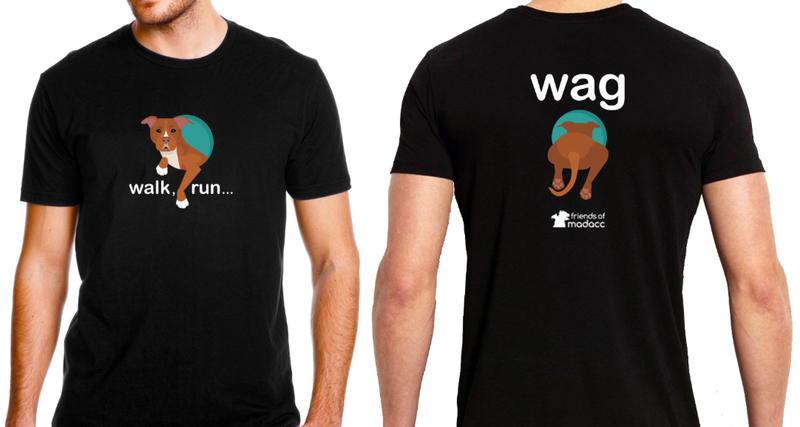 During the online registration process, after selecting your race day t-shirt size, you’ll be given the option to “Create New Fundraising Page.” Choose your charity — Friends of MADACC is the only option, but you still have to select it! Follow the prompts to complete registration and payment. Then tell friends, family, co-workers, neighbors and anyone else about your page. Just remember: Online registration closes 11:59 pm Sunday, June 15. Don’t wait!